Update: The news of an eye witness does not change my assessment below. But one man’s testimony could be key for the police. “The guy on the bottom who had a red sweater on was yelling to me: ‘help, help…and I told him to stop and I was calling 911,” he said. Trayvon Martin was in a hoodie; Zimmerman was in red. The witness only wanted to be identified as “John,” and didn’t not want to be shown on camera. His statements to police were instrumental, because police backed up Zimmerman’s claims, saying those screams on the 911 call are those of Zimmerman. Yes, but… Here’s the problem. What if the gun had been drawn and that led to the scuffle? Or what if Zimmerman confronted Trayvon and patted his side where the gun hid as an arrogant gesture dominance? Whose actions initiated the physical confrontation? 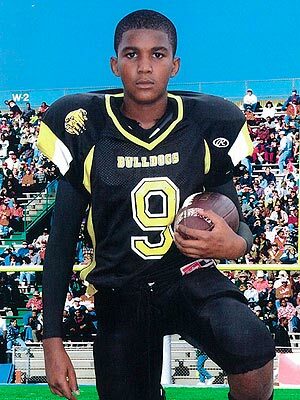 Just because Trayvon was winning the fight (no surprise there, being a young football player) does not make him the instigator. As we know, the instigator was the one who refused to keep his distance until police arrived. The point is, Trayvon had NO IDEA who this nut was stalking him, confronting him. For all he knew Zimmerman wanted to rob him. And that is why the self defense claim is also Trayvon’s – and why Zimmerman is still at fault for causing the incident to escalate. Zimmerman had to have pushed Trayvon into a fight or flight decision. There is no other reason for the attack on Zimmerman. – end update. “It’s not a question of who that young man looked like. Any young American of any ethnic background should be safe, period. We should all be horrified no matter what the ethnic background,” Gingrich said. Absolutely. And we are horrified for this young man and his family. Our prayers go out to them all. Civil rights leader Jesse Jackson said Friday that he’s grateful the rest of the country has sat up and taken notice of the tragic slaying of Trayvon Martin. But he can’t help but wonder: Why has it taken so long for everyone else to recognize the chronic injustices that African Americans face? As someone who can’t shut up about race and obsesses over barriers that some can’t get past, Jackson has himself to blame for this as much as anyone who takes a human tragedy and tries to turn it into a race war. George Zimmerman, the man who should be charged by now, is colored (Hispanic). This is not about race, but about one egotistical, small little man. We don’t need to take one fool’s mistake and light up 100’s more. Jackson is just trying to regain some of his media attention – nothing more. What happened is clear. George Zimmerman was playing cop. He was a self anointed vigilante – with a gun. He wanted to play Rambo. He stalked young Trayvon – against direction from the police. He instigated any confrontation that ensued by coming to the victim and not keeping his distance. He did this knowing full well he was armed with a loaded gun. Zimmerman went looking for trouble, went looking for a confrontation. He had hundreds of opportunities to stay back and stay clear of Trayvon. Whatever ensued that ended with Trayvon dead, the simple fact is it would not have happened if Zimmerman had just kept his distance. That is all you need to know about this. If Zimmerman stayed back Trayvon would be alive. And that makes it Zimmerman’s fault. Trayvon has the same right to self defense as Zimmerman. Trayvon was the one being stalked. We have no idea if the gun had been pulled and never will. If Zimmerman kept pushing Trayvon to the point he felt he had to defend himself, then Zimmerman is the guilty one. In my mind there is only a question of whether it was deliberate or accidental manslaughter. Beyond that this case is not complex. Just tragic and sad. And we don’t need more Zimmerman’s popping up confronting others in anger and fear. That is not what Trayvon Martin deserves as the final epitaph for his too short life. If the President or his supporters continue to poison this tragedy further, they will lose the support of every family who wants justice in this case. And justice does not come from the lynch mob, nor the misguided vigilante. “SANFORD — Members of the New Black Panther Party are offering a $10,000 reward for the “capture” of George Zimmerman, leader Mikhail Muhammad announced during a protest in Sanford today. The bounty announcement came moments after members of the group called for the mobilization of 10,000 black men to capture George Zimmerman, the Neighborhood Watch volunteer who shot Trayvon Martin last month. This is the left and radical black racists at work including Obama, Holder, Sharpton and Jackson! See my post above because what will you do if 10,000 racists are turned loose upon your cities and neighborhoods. This must end, my fear is with the racists in charge now it will not end well and I’m not talking about Travon, I’m talking about those using his death to incite violence. A lot we aren’t being told, as I said the media is pushing an agenda, Obamas agenda. organizing his racists, his unions and his Occupy Wall Streeters with SEIU help this time, and the Presstitutes will carry his propaganda. I have heard so many stories about what went on, I don’t know how anyone that hasn’t actually read the investigative reports can really know what happened. It certainly should be investigated fully and any judicial actions taken if the evidence calls for it. Some contradictory stories I have heard. He lived in the gated community. His father didn’t live there, he had a friend that did. He didn’t know anyone that lived in the community. NONE of these matter so why are there so many versions? The only thing Martin had was a can of iced tea and skittles. His girlfriend said she was talking with him on his cell phone. Is there an eye witness or not. I’ve seen reports that there is an eye witness and his story supports Zimmerman’s story. It was reported that Zimmerman was the chief of the neighborhood watch. It was reported he was only on an errand and saw Martin. The truth is what is important. A thorough investigation should be conducted and if there is something he should be prosecuted for, then so be it. If the evidence indicates he should not be charged, then so be it. Justice should be the important result of this. I’ve seen some saying Zimmerman should be hanged without a trial. You can’t cure stupid. Certainly anytime someone is killed for what appears to not be any good reason, it is a tragedy. We need to know why this occurred. Obama, Sharpton and Jackson are plainly making racial statements for personal gain. these are more properly referred to as ethnic groups. In fact, it is hard to find anyone that any longer recognizes the old traditional races, such as Caucasian, Mongoloid, and Negroid, etc. Zimmerman armed himself. He set himself up to be a lawman. He made several references to Martin’s race. He said, “They always get away with it.” He pusued him. ETC. We don’t know exactly how it happened, but by his actions Zimmerman initiated the confrontation with Martin. If I was being followed by a guy at night under darkness and he pursued me as I was trying to lose him I just might turn and attack him… in self defense. My only thought is that Martin made the mistake of not knocking Zimmerman senseless. If anyone has ever taken any self defense traiining you know the first rule: avoid a physical altercation if at all possible, but if you can’t, make sure to get in the first blow and make sure it is devastating. Layman, congratulations, somehow you appear to be privy to information no one else is, especially from what we’ve seen in the police report. I did hear ‘one’ racial thing on the 911 tapes, but not ‘several’. Where did he ‘set himself up to be a lawman’? Now this is an astonishing statement: “He pusued him. ETC. We don’t know exactly how it happened, but by his actions Zimmerman initiated the confrontation with Martin.” we don’t know, but…… by his actions….initiated the confrontation…..
Would you run thru your thought process on this? We don’t know, but….. what does ‘we don’t know’ mean? If you were being followed by someone at night? you know this happened how? which one was being followed? So let me get this straight. If you are walking down the street at night and there is a person behind you, you ‘might’ attack him in ‘self defense’? I’ve been on a sidewalk at night many times with ‘someone’ behind me and I have never attacked them in ‘self defense’ or for any other reason. Are you a psychic? do you have esp? Is it possible that Zimmerman may have broke contact when the 911 operator suggested it, but had been seen by Martin who then proceeded to attack him as he returned to his truck? Do you think it should be investigated or should they just go ahead and hang Zimmerman? Just curious. Do you think ‘justice’ has a place in this case? just curious. Now you’ve been hanging out at the bar. 1) On the 911 tapes that have been released Zimmerman makes 3 references to Martin’s race. 2) He says “They always get away with it.” (real quote, not paraphrase). 3) He was armed and has admitted the gun was his (I didn’t have to make that one up). 4) He tells the 911 operator that he is following him – I used the word pursue, and given his out of breath condition I’d say that is a correct descriptor. Given that last point – I am perfectly justified to say that Zimmerman initiated the confrontation. Maybe “repsonsible for” would have been another way of saying the same thing. I’m not psychic and I don’t have ESP, I just read the news and analyze it. Maybe you should give it a try. Last thing… since when does drawing an opinion, based on the facts that we know, and expressing it on an opinion blog, suggest that someone is up for a lynching? Just curious!